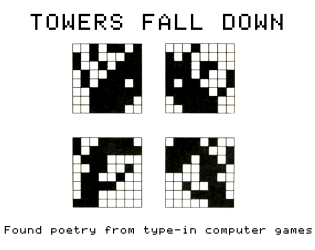 TOWERS FALL DOWN is a collection of found poetry from type-in computer games of the 80s. All of the lines of the poems below were taken from strings of code, mostly from books by Usborne(especially The Mystery of Silvermountain and Island of Secrets) and K-Power (Computer Olympics). They appear exactly as formatted in the source material. YOU DIDN'T LISTEN, DID YOU? AHEAD ARE SHEETS OF UNPASSABLE FLAME. AS THE RACE GETS LONGER. WRONG ANSWERS SLOW YOU DOWN. IT IS NOT TIED TO ANYTHING! IT IS NOT BIG ENOUGH! IT SHATTERS RELEASING A DAZZLING RAINBOW OF COLORS! IT MAY JUST SAVE YOUR LIFE!!! YOU NEED TO PHONE HOME. TAKE A LONG SHOWER AND DON'T COME BACK! TRY AGAIN IN FOUR YEARS. YOU BOTH GET GOLD MEDALS.